In the late 1980s, Children’s Aid (formerly The Children’s Aid Society) worked with city planners to assess unmet needs in New York City neighborhoods. Through this process, the urban planners identified Washington Heights in northern Manhattan as the most underserved neighborhood in the city. Schools were vastly overcrowded, and social supports for children and families were greatly oversubscribed. The planners also identified a tremendous mismatch between the kinds of community resources available and the actual needs of the community, owing in large part to dramatic demographic shifts as the neighborhood became the port of entry for immigrants coming to New York City from the Dominican Republic and other Caribbean and Latin American countries. Subsequent meetings between Children’s Aid and the then-Board of Education revealed that the New York City School Construction Authority planned to build several new schools in Washington Heights. 1 Rather than building multiservice community centers in Washington Heights, Children’s Aid decided to join forces with the school system to serve this high-need community with community schools. In recent years, rising poverty, family breakups and removal to foster care, stress from immigration status, and homelessness have increased the share of children with major mental and emotional health issues. These manifest in schools primarily as student behavioral health challenges and difficulties with regulating emotions such as anxiety and depression. Almost half of the youth seen for mental health services have a primary diagnosis of anxiety or depression (45%). The marked increase in children presenting with these concerns can be seen both as a response to societal factors (high stakes academic testing, changes to immigration laws, increases in community violence) and increased familial stress in these communities (housing instability, food insecurity, domestic violence, parental substance use). Community school activities carry straight into enriching summer camp activities to prevent summer learning loss. The Bronx: C. S. 61 The Francisco Oller Campus; Fannie Lou Hamer Middle School; Fannie Lou Hamer Freedom High School; C.S. 211 The Bilingual Magnet School; P.S. 301 Paul Dunbar Middle School; I.S. 318; X 458 Samara Community School; P.S. 314 Fairmount Neighborhood School; I.S. 219 New Venture School; Opportunity Charter School; Bronx Career and College Prep; Children’s Aid Society College Prep Charter School. The Children’s Aid community schools’ approach to school improvement is grounded in four overarching capacities. The first two of these illustrate the daily work of Children’s Aid, while the latter two help explain how the initiative has been able to scale up and its success in becoming increasingly self-sustaining. These four capacities include: (1) Collaboration: Children’s Aid works to ensure the involvement of a range of key stakeholders—educators, parents, students, funders, community members, service providers, and policymakers; (2) Comprehensiveness: Children’s Aid community schools respond to a wide spectrum of identified needs and work to boost students’ strengths by marshalling the full complement of partner resources; (3) Coherence: Children’s Aid invests financial and staff resources in programs intended to produce targeted results and coordinates and integrates systems of management; and (4) Commitment: from the start, Children’s Aid employs strategies geared toward making its efforts more sustainable. In order to serve the range of student needs across its now-23 New York City schools, Children’s Aid has developed a number of partnerships, both public and private. These include city and state agencies, nonprofit organizations, health care providers, higher education institutions, private funders, and others, including businesses. Children’s Aid. As the lead agency, Children’s Aid directly provides a wide array of services and also engages other youth development, cultural, and health partners. Each school has a full-time community school director, a full-time program director, and a part-time education coordinator. Most schools also have a full-time parent coordinator. Children’s Aid is responsible for hiring and supervising these (and other) staff members, and it generates most of the resources that support their salaries and other program costs. New York City. In the community schools, Children’s Aid actively collaborates with several city agencies, including the departments of Education, Health, Mental Health, and Homeless Services; the Administration for Children’s Services; Human Resources Administration; and Youth and Community Development departments. As a result of the city-wide expansion, the Children’s Cabinet (an inter-agency council comprised of all City agencies that work with children) has greatly increased the outreach of governmental agencies working in community schools, particularly around immigration, homelessness, and mental health issues. New York State. The New York State Education Department and the Office of Children and Family Services provide funding and other supports for Children’s Aid work in its New York City community schools, through such programs as 21st Century Community Learning Centers, Advantage After-School, Extended-Day/Violence Prevention and the specific community school grants initiatives. Community. 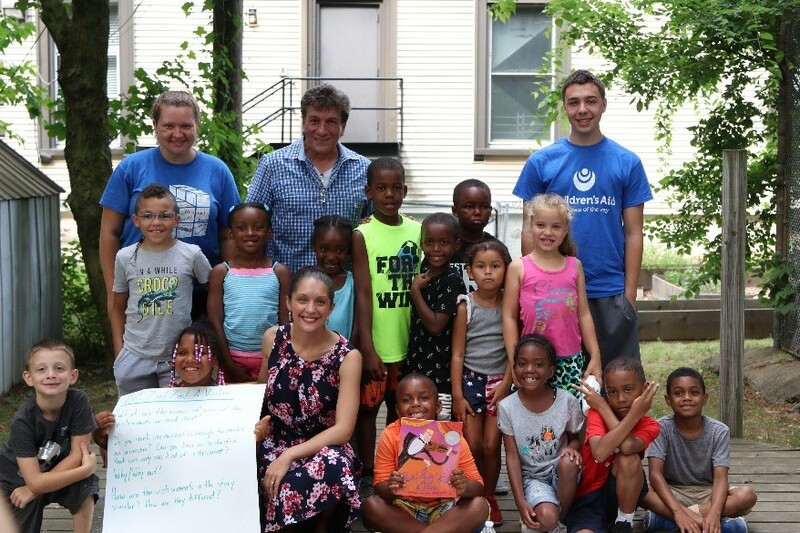 A number of community organizations work with Children’s Aid to provide supports for academic, social, and cultural enrichment (these include Alvin Ailey American Dance Theater, American Ballet Theater, Boys and Girls Clubs of America, and the Developmental Studies Center/Center for the Collaborative Classroom); health (Columbia Presbyterian Hospital and Mount Sinai Medical Center); and others, such as Cornell University. Children’s Aid integrates a Zero to Five model in several elementary-level community schools to ensure that young children get off to a strong start. Children’s Aid also offers a variety of early childhood education programs in its other elementary-level community schools—an expansion that was fostered largely by increased city funding of early childhood programs, including the most recent expansion (2014-18). Children’s Aid community school students registered more than 25,000 visits to five school-based health centers. For many years, Children’s Aid has operated five school-based health centers, which serve students in eight of its Washington Heights and Staten Island community schools. These health centers provide comprehensive care, including medical, dental, and mental health services. 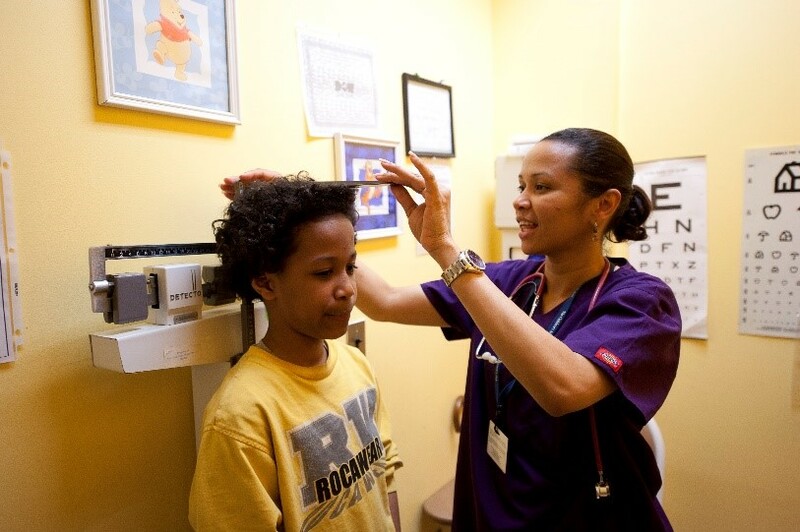 In 2017, Children’s Aid opened a sixth school-based health center in the Bronx. 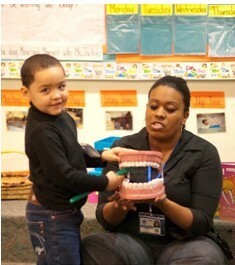 In addition, Children’s Aid uses a “school-linked” model in the Bronx, providing comprehensive health services at the centrally located Bronx Family Center, a Children’s Aid facility, for students in its Bronx community schools that are not served by the new school-based health center. Many children are trying to cope with stresses of poverty, family break-ups, high-stakes testing, and changes to immigration and other policies, through maladaptive strategies such as substance use, self- harm, or over eating. There has been increased reporting of suicidal thoughts and behaviors expressed by students, recently among younger students. Other students present with externalizing behaviors like attentional issues, oppositional defiant disorder, and violence or lashing out at others. For some, what is really a response to traumatic experiences can look to educators like attentional problems, hypervigilance may be seen as distractibility, triggered emotional dysregulation as anger, dissociation as apathy and withdrawal. Almost one in four students have parent-child conflicts, which weigh on students’ emotional wellbeing and interferes with academic functioning. Bullying, particularly cyber-bullying, is another common driver of mental health problems. Youth who are struggling with identity, particularly L.G.B.T.Q. youth, are especially vulnerable. One student recently expressed suicidal thoughts after a family friend threatened to inform his fundamentalist father of his sexual orientation. The clinician provided a safety plan and worked with the family to ensure his safety. In another school, where a youth was being bullied for coming out, interventions includes anti-bullying groups, teacher trainings on supporting these students with, and building a culture of tolerance in the school community. A student presented last year in the Children’s Aid clinic with what seemed like psychotic symptoms. She had a traumatic history, including sexual and physical abuse and was in a foster care. This year, with trauma focused cognitive behavioral therapy and medication management, she is symptom free and has just been adopted. 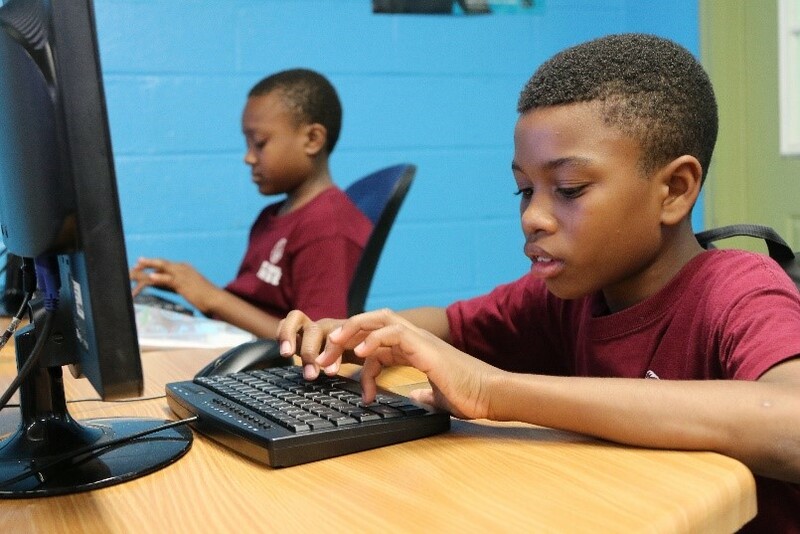 Expanded learning opportunities, like the computer lab, complement the school curriculum. Sports: Basketball, swimming, volleyball, softball, soccer, track and field, martial arts, double-dutch jump rope, family fitness, and archery. Arts programs: Visual arts, creative writing, music, dance, and theater. Other offerings: Debate, chess, recreation (ping-pong and pool), cooking, Recycle-a-bicycle, leadership clubs, mentoring, college and career preparation, and field trips. 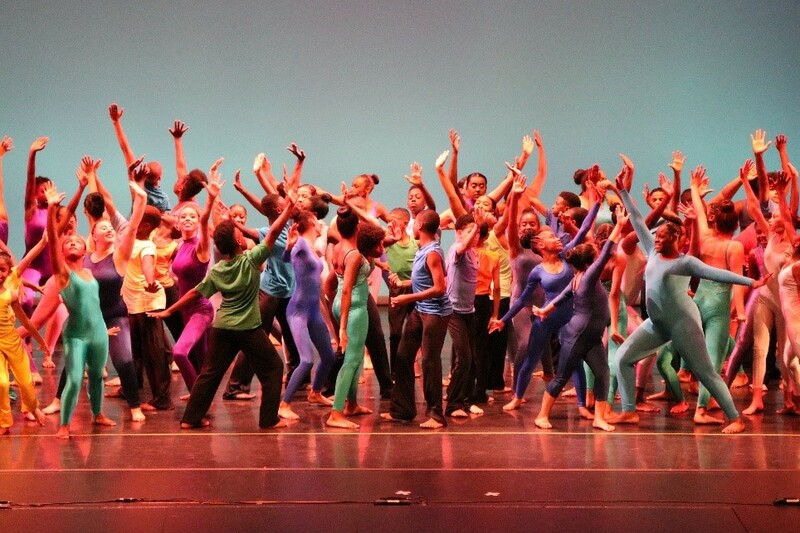 AileyCamp is an unforgettable summer experience that extends enrichment activities for many students at Children’s Aid community schools. Children’s Aid is a founding member of Boys & Girls Clubs of America (BGCA), and virtually every Children’s Aid site operates as a Boys & Girls Club. Many of the programs, clubs, and classes offered at Children’s Aid Society community schools use BGCA curricula, such as SMART Moves, Goals to Graduation, PASOS and Project Learn. Parent/Family Engagement. Children’s Aid Society community schools provide an extensive range of programs and services for parents and other family members. These include adult education classes, cultural events, immigration assistance, and programs to help parents support their children’s education. Families can also access a wide array of support services, such as signing up for benefits (health insurance, Earned Income Tax Credit) and receiving financial assistance through Children’s Aid’s participation in The New York Times Neediest fund drive. The longevity and success of the Children’s Aid community schools can be attributed both to intentional practices and strategies—some established from the start, others that have evolved with its expansion —and to specific local, state, and federal policies that support the initiative. Policies and funding streams that support the development of the “whole child” are more supportive than those that take a narrow view of children’s learning. A good example of this kind of enlightened and supportive public policy at the federal level is the 21st Century Community Learning Centers section of the Elementary and Secondary Education Act (ESEA), which explicitly focuses on “positive youth development” and “enrichment,” and encourages potential grantees to pay attention to multiple domains of young people’s development, including social, emotional, and physical development in addition to the cognitive aspects. The latest (December 2015) reauthorization of ESEA—the Every Student Succeeds Act—has taken a more holistic view of education than its predecessor, and offers specific provisions for community schools at the federal level while also requiring states to propose “non-academic” indicators of student success. Similarly, New York State’s support of school-based health centers, after-school programs, and community schools recognizes the inextricable links among the multiple domains of student learning and development. New York State has led the nation in its explicit funding for community schools—providing more than $150 million for community schools through state foundation aid to low-income school districts in FY 2018 alone. At the city level, Mayor de Blasio has far exceeded (more than doubled) his 2014 campaign promise to increase by 100 the number of community schools in New York City during his first term, making the New York City community schools initiative the largest in the country. This expansion effort was made possible by the investment of substantial New York City tax levy dollars as well as by braiding available the kinds of state and federal dollars outlined above. Children’s Aid has benefitted from all of these funding streams, and has also provided as a long-term sustainability model, demonstrating how community schools can blend categorical funding into a comprehensive and holistic approach, using diverse resources (public and private, education and non-education, human and financial). Joint planning, a key component of the community schools strategy, begins when Children’s Aid and a school’s administration decide to join forces and continues as members of the Children’s Aid community schools staff are fully integrated into each school’s Leadership Team, School Safety Committee, Pupil Personnel Team and other governance, planning, and decision-making bodies. Most schools also hold annual planning retreats that involve DOE and Children’s Aid staff. The Children’s Aid board made a significant initial commitment to its community schools that has continued over the past 25-plus years. Each year, Children’s Aid raises and/or allocates several million dollars in support of its school-based work. This long-term commitment provides the initiative stability that would otherwise not be possible. As described in more detail below, public dollars from a variety of sources provide two-thirds of the funding for the additional supports and services, and private dollars provide the remaining one-third. From the outset, Children’s Aid has commissioned a variety of third-party evaluations to assess the results of its work. These results have been used for continuous improvement in a variety of ways, such as strengthening communication and partnerships with teachers, and for advocacy purposes. Around 2000, Children’s Aid contracted with CitySpan, a West Coast technology company, to customize its Youthservices.net software for Children’s Aid Society community schools. Many organizations use this software to track participation in after-school programs but Children’s Aid wanted to track and enable analysis of the many other services and programs it provides as well as a full-service initiative. Data from this system supports both continuous improvement efforts and external evaluations. Children’s Aid was one of the three founding members of the Coalition for Community Schools, a national organization established to advance federal policies that support community schools. As an active member of the coalition since its inception in 1997, Children’s Aid participates in federal, state, and local advocacy activities through the national coalition and through other collective efforts including the New York State After School Network, the national After School Alliance, the New York City Campaign for Children (which played a major role in Mayor de Blasio’s investments in and expansion of community schools), and the national and state Alliances for School-Based Health Care. Recently Children’s Aid took the lead, working with an array of key partners, in developing the New York State Community Schools Network. All of this work enables Children’s Aid to collaborate with other like-minded organizations to foster the development of evidence-based public and social policies that respond to the documented needs of students and their families. Examples of such policies and resulting programs are the Federal Full-Service Community Schools discretionary grants program; the 21st Century Community Learning Centers program; and the New York State Community Schools grants and aid programs. Recognizing the importance of scaling up the Children’s Aid community school strategy in other districts and states, Children’s Aid founded the National Center for Community Schools in 1994 to respond to growing demand for information and advice about community schools implementation. The Center has worked with community school initiatives in over 80 cities across the United States and has hosted visitors from 75 other countries who have come to New York City to learn about the community schools strategy and see schools in action. The NCCS staff team has assisted most of the country’s major community schools initiatives with their initial and scaling efforts, including: Albuquerque, Baltimore, Buffalo, Chicago, Cincinnati, Detroit, Flint, Hartford, Oakland, Portland (OR) and San Francisco. The Center’s services—study visits, training, consultation, strategic planning advice, and written and electronic tools—have contributed to the development of over 17,000 community school adaptations across the United States and abroad, the large majority of them in the United Kingdom – England as well as Wales and Northern Ireland. Children’s Aid leverages a variety of public and private funding streams to underwrite the range of supports it offers, and it will continue to need to creatively identify new ones as the reach of community schools expands in New York City. It is hard to separate funding streams/sources into federal, state, and local channels since many of them are a combination (for example, Medicaid originates at the federal level but is administered by the state, and 21st Century funds originate in the federal Elementary and Secondary Education Act but get administered by the state). Public sources that come from all three levels thus include Medicaid and Child Health Plus for medical and mental health services; federal Early Head Start, NYC Early Learn, and the pre-K expansion for early childhood programs; and 21st Century Community Learning Centers, New York State Advantage and Extended-Day/Violence Prevention programs, and the New York City Out-of-School Time initiative for after-school and summer enrichment programs. Private sources include a number of national and local foundations, corporations and individuals. Some of the foundation supporters direct their grants to a specific program or school within the comprehensive, multi-site framework of Children’s Aid’s community schools. Major support for the work includes the Charina Endowment Fund, the Charles Hayden Foundation, Morgan Stanley, and the Teagle Foundation (directed toward the college access program at Fannie Lou Hamer Freedom High School). Parent engagement is a cornerstone of the community school strategy. A 2009 ActKnowledge evaluation, conducted just after the NYC Department of Education began comparing individual schools’ progress with that of all city schools and with peer schools, found that Children’s Aid Society community schools averaged greater student achievement gains than other schools. It also found that the community schools had “far higher” attendance than peer schools, and that schools with on-site health centers tended to have higher attendance than those without centers. Collaborative advocacy efforts with allies have led, among other things, to the establishment of the federal Full-Service Community Schools discretionary grants program, the 21st Century Community Learning Centers program, and the New York State Community Schools grants and aid programs. Jane Quinn, [email protected], More information on Children’s Aid Community Schools is available at childrensaidNYC.org and at www.nccs.org. 1. That body is now the NYC Department of Education. 2. C. Warren Moses, “History of the Children’s Aid Society Model,” in Community Schools in Action: Lessons from a Decade of Practice, Joy G. Dryfoos, Jane Quinn, and Carol Barkin, eds., New York: Oxford University Press, 2005, p. 16. 4. Luis A. Malavé, “The Power of Two or More: Partnership from a School Administrator’s Perspective,” in Community Schools in Action: Lessons from a Decade of Practice, Joy G. Dryfoos, Jane Quinn, and Carol Barkin, eds., New York: Oxford University Press, 2005, pp. 129-30. 5. Andrew Seltzer, “Early Childhood Programs,” Community Schools in Action: Lessons from a Decade of Practice, Joy G. Dryfoos, Jane Quinn, and Carol Barkin, eds., New York: Oxford University Press, 2005, p. 73. 6. Elaine Weiss correspondence with Aaron Newman, March 2018. 7. Beverly A. Colon, “School-Based Health Services,” Community Schools in Action: Lessons from a Decade of Practice, Joy G. Dryfoos, Jane Quinn, and Carol Barkin, eds., New York: Oxford University Press, 2005, p. 85. 10. Hersilia Méndez, “Parent Involvement and Leadership in Action,” Community Schools in Action: Lessons from a Decade of Practice, Joy G. Dryfoos, Jane Quinn, and Carol Barkin, eds., New York: Oxford University Press, 2005, p. 42. 11.Coalition for Community Schools CAS NYC one-pager. 12. Jane Quinn notes that the outcomes from these schools are “not necessarily the best, but [they provide] the most number of years–hence, the most longitudinal data, which allowed the researchers to make the best SROI predictions.” Elaine Weiss correspondence with Jane Quinn, Jan. 2018. 13. National Center for Community Schools, Building Community Schools: A Guide for Action, New York: The Children’s Aid Society, 2011. 14. Margaret Caspe and Joy Lorenzo Kennedy, Sustained Success: The Long-Term Benefits of High Quality Early Childhood Education, New York: The Children’s Aid Society, June, 2014. 15. “CAS Community Schools: Results to Date” in Building Community Schools: A Guide for Action, The Children’s Aid Society, 2011, pp. 28-31. 16. Ellen Brickman, Anthony Cancelli, Arturo Sanchez, and Glenda Rivera, The Children’s Aid Society/ Board of Education Community Schools Third-Year Evaluation Report, New York: Fordham University Graduate School of Education and Fordham University Graduate School of Social Services, 1999. 17. “CAS Community Schools: Results to Date” in Building Community Schools: A Guide for Action, The Children’s Aid Society, 2011, pp. 28-31. 18. Laura Martinez and Cheryl D. Hayes, Measuring Social Return on Investment for Community Schools: A Case Study, Washington, DC: The Finance Project, 2013. 19. “As explained in CAS’s project summary, “CAS proposes to bring the full set of parent engagement strategies piloted in one highly distressed NYC community … to another… to verify whether inschool parent resource centers – with parent coordinators trained in utilizing a specific set of parent communication, outreach, and organizing strategies, and adult education classes and leadership institutes – lead to increases in student achievement.” From Michele NcNeil, “25 New i3 Winners to Split $135 Million,” Politics K-12 (Education Week blog), November 8, 2013. 21. Peter Svab, “Bill de Blasio’s Community School Plan Will Need a Lot of Love to Succeed,” Epoch Times, February 20, 2014. 22. “To be eligible schools must be struggling with student attendance, Deputy Mayor Richard Buery said after a press conference Tuesday. The city will use a state education grant to supply each school with at least $300,000 annually for four years, depending on its size and needs, Buery said.” From Patrick Wall, “City Launches $52 Million Plan to Turn 40 Schools into Service Hubs,” Chalkbeat New York. 23. Elaine Weiss correspondence with Jane Quinn, April 2018.